TRUMBULL, Conn. — Athletes came together at 11 CrossFit gyms across Fairfield County to help Cameron "Cam" Simpson, a 1-year-old from Trumbull who has AHC, or Alternating Hemiplegia of Childhood. 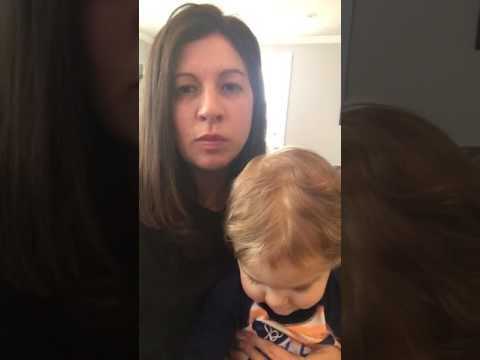 The adorable toddler and his mother are seen on a video thanking the volunteers who took part in "Workout of the Day" last weekend to fund AHC research. The gyms collectively raised more than $10,000. AHC is characterized by recurrent attacks of temporary paralysis, stiffness and unusual eye movements. There is no cure for AHC, which is an extremely rare genetic disorder. The 11 local Crossfit gyms joined together to participate and compete in “the Cam” Workout of the Day to raise funds for the AHC Foundation (ahckids.org), an organization striving to develop research for effective treatments, to find a cure and for the family of Cameron. The Cam workout or “WOD” was designed by Molly McMugh, Cameron’s cousin. It challenged the gym members to do 19 repetitions of a variety of exercises and to do it as many times as possible in 19 minutes. Cam is a happy little 1-year-old boy who is literally one in a million, as the prevalence rate of the mutation is one in a million. He adores his older brother, Tyler, and he and his family enjoy life as much as possible. But with Cameron suffering from AHC, life can be hard to predict. Cameron, along with just 850 cases worldwide, will grow up with the disorder and its symptoms. A Cure For Cam is a nonprofit team that is raising money for finding a cure for AHC. In June, A Cure For Cam will be hosting a fundraiser dinner at the Gaelic American Club, Fairfield.